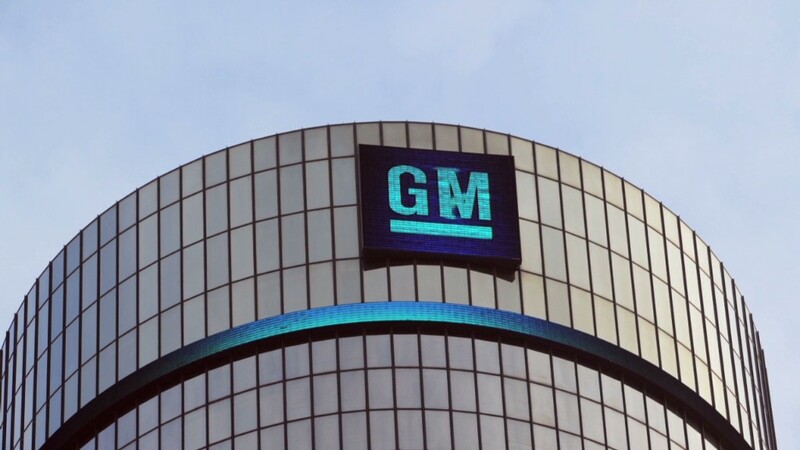 General Motors offered at least $1 million Monday to the families of those who died as a result of a defect in GM cars. The automaker will give another $300,000 for each surviving spouse and dependent, in addition to a sum of money that will be determined by the victims' earning potential. GM also said that it will not cap the total amount of money it will pay to the compensation fund. At least 13 people died, and many more were injured as result of a faulty ignition switch installed in 2.6 million GM cars. The automaker is also offering money to those injured in crashes that were caused by the defect in the cars. GM employees first knew that the ignition switches were malfunctioning back in 2004. But the automaker didn't issue a recall until a decade later. Some deaths and injuries could have been avoided had the recall been issued sooner. 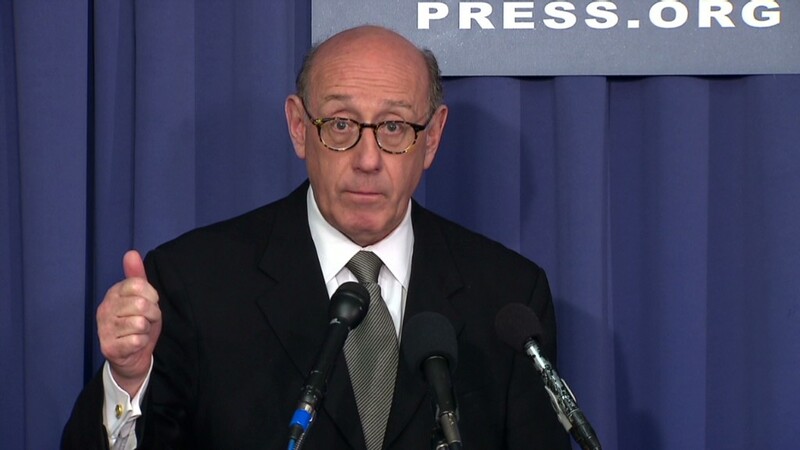 Attorney Kenneth Feinberg, who devised compensation plans for victims after 9/11 and the BP oil spill, issued the details at a press conference Monday, about four months after GM recalled the affected vehicles. He was hired by GM (GM)in April as a consultant. To illustrate how his plan would be implemented, Feinberg offered some examples. He said the family of a married 25-year-old who had two children and was earning $46,400 would receive a total award of $4 million under his protocol. "Money is a pretty poor substitute for loss... but we can't restore limbs," Feinberg said. More deaths will be counted. Feinberg would not speculate Monday as to the actual number of deaths or injuries caused by the faulty switch. But he did say that he would count deaths that weren't included in GM's original list of 13. Until now, the automaker only counted deaths caused by frontal crashes where airbags didn't deploy. Feinberg said Monday that people killed in side-impact crashes or in the backseat will count even though they wouldn't have been helped by an airbag. Additionally, the passengers and drivers in any other cars involved in a crash are all eligible, as are any pedestrians involved. Victims may file a claim even if their own negligence, such as speeding or driving drunk, contributed to the crash. Feinberg will have the final word as to which claims will and will not be paid out by GM. The automaker itself will not have a say in the decision making. Pay to injured victims based on hospital stay. Payouts to those who suffered serious, life-altering injuries will be determined on a case-by-case basis. Those with less serious injuries will be paid depending on the number of nights they spent at the hospital. Someone who spent one night in the hospital will receive $20,000, while someone hospitalized 32 nights or more will be paid $500,000. Waiving the right to sue. 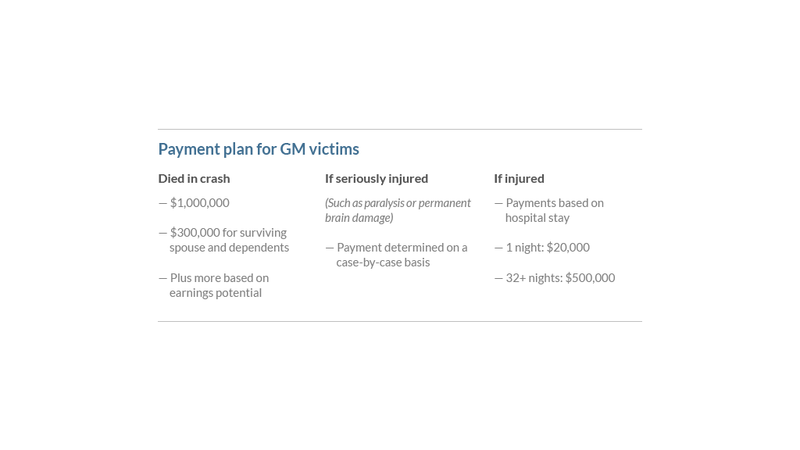 The compensation plan does come with a caveat: Any victim who accepts the money waives their right to sue GM. The program is voluntary, and victims can bypass the whole thing and take GM straight to court instead. Taking the automaker to court could be an uphill battle for anyone involved in an accident prior to GM's 2009 bankruptcy, since those events were the responsibility of the "old GM," as opposed to the new company that emerged from Chapter 11. In an interview after the announcement, Feinberg told CNN's Poppy Harlow that he believes victims would be better off filing a claim with him rather than pursuing litigation in court. Victims don't have anything to lose by participating in Feinberg's claim process, since they don't waive their right to sue until they accept compensation. Feinberg also noted that the program is not meant to punish GM, which is currently being investigated for criminal wrongdoing. "I am trying to provide some meaningful relief to these innocent victims, that is my singular goal," Feinberg said. Anyone who lost a loved one or was seriously injured in a crash related to the recall can file a claim with GM between Aug. 1 and Dec. 31, 2014. Feinberg also said he will hold a private meeting with any claimant that wishes to do so.